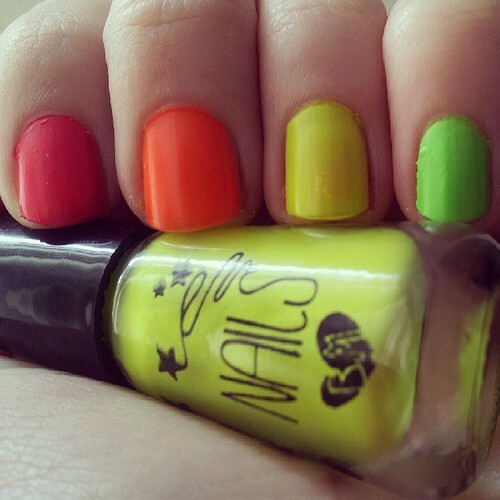 I picked this set of neon polishes up on a whim - I was standing in the queue at Mr Price and they caught my eye. I've been on the fence about neon polishes - I didn't want to spend a lot of cash on something I wouldn't get much wear out of - so this super-cheap set was a perfect way to dip my toes into the neon pool. The pictured swatches are with two coats of colour - if you have long nails, you may need more coats or a white base coat to hide any visible nail line. The green polish was the most opaque (almost a one-coater), but the orange and yellow are significantly sheerer. What I liked about these polishes was the quick dry-time and, unexpectedly, the matte finish (which isn't very visible in the photo due to the natural light). One thing I did notice was the completely different way these polishes behaved depending on the base coat I used. With my Tip Top strengthening base coat, I had a perfectly smooth finish. However, I first tried with my Essence peel-off base coat (which I prefer to use for swatching days, for the solvent-free removal), and the finish was awful. I'd never seen a polish ripple, bubble and form ridges the way all four of these did. So just a heads up that if you do get an odd finish with a polish, try using a different base coat before writing it off. I've never bought polish from Mr P. How long did they last on your nails? This was my first time trying Mr P's polishes - I got 3 days in before my first chip (with base coat but without top coat).